Continuing with the developing theme of post previews, these creatures and their nearest and dearest will be the subject of Taxon of the Week tomorrow. What are they? Update: Identity now available here. Image from here. I mean...that's Dermatophagoides right? Is this some kind of trick? No one said I had to be mean all the time :-). 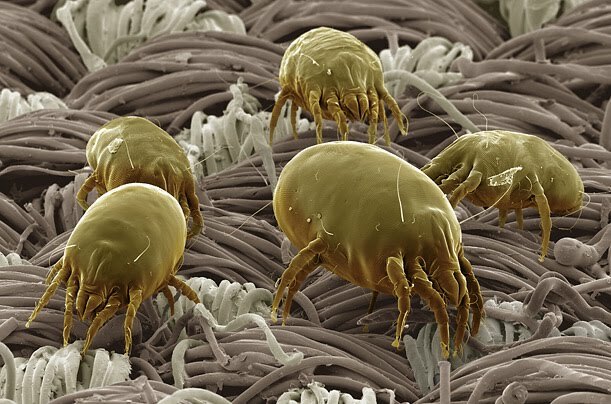 Expect a post on the glories of astigmate mites tomorrow. I always look at these. This is the first time I even had an inkling of what it is. House dust mites. But of course, I found the comments too late. Looks like Dermatophagoides and probably D. pteronyssinus (this image certainly appears as such on a few sites using a Google Image search). In my experience, Dermatophagoides farinae is more common in Queensland, and as I recall Euroglyphus maynei and Blomia tropicalis tend to be more prevalent in some areas. I wish I could say more, but my wife is still reading Matt Colloff's book and I'm stuck in the lower astigmatines - aka Oribatida. Have you seen the recent Dabert et al. Mol Phylogenet Evol. 2010 Jul;56(1):222-41? Well worth a read. Sorry folks you're well-intentioned but quite wrong... These are moon-calves of Yuggoth, with their hideous, protoplasmic Daemon Herder, Astaroth (just out of shot), browsing on the exposed sulci of the giant pulsating brain of Yog-Sothoth in a dimension beyond the perception of puny humankind. Fillet of Yuggothian Moon Cow in a white-wine and garlic sauce is great with sauteed Fungi from Yuggoth caps and mixed veggies!